MOUNTAIN VIEW, CA - February 26, 2014 – eHealth, Inc. (NASDAQ: EHTH), which operates eHealthInsurance.com, the nation's first and largest private online health insurance exchange for individuals and families, today launched the eHealth Price Index, the first and only tool of its kind that tracks on a daily basis the average monthly cost of individual and family health insurance for plans based on applications submitted nationwide through eHealth. As of February 24, 2014, the average premium for an individual health plan selected through eHealth without a subsidy was $274 per month, a 39% increase from the average individual premium for pre-Obamacare coverage1. The most recent average premium for plans without a subsidy chosen by families was $663 per month, a 56% increase over the average family premium in February, 2013, which was $426 per month. In addition to tracking consumer enrollment costs every day, the eHealth Price Index also shows the average age of individual applicants, the average family size for family applicants, and the most popular metal level (e.g. bronze, silver, etc.) chosen for both individuals and families. The average age of individuals submitting applications through eHealth as of February 25, 2014 is 36. The average family size for families enrolling in coverage through eHealth is three family members. For both individual and family applicants, bronze plans have been the most popular plan type chosen since the beginning of the current Open Enrollment Period. 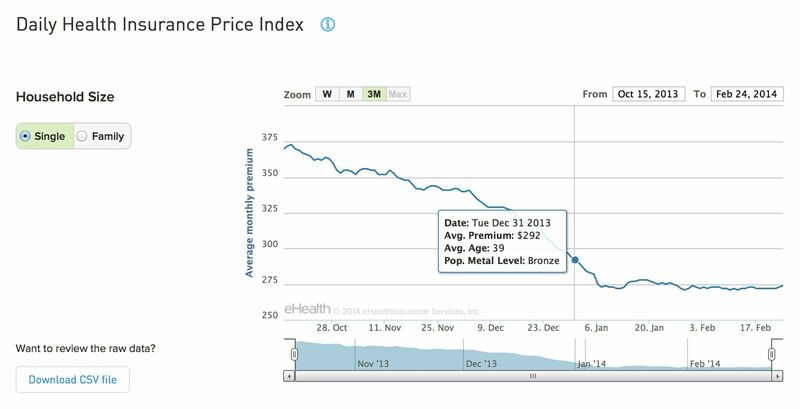 The eHealth Price Index tracks consumer behavior over time, as a rolling 14-day average, providing data as early as October 15, 2013. Premiums for individual plans selected by eHealth customers on October 15 averaged $374 per month, but dropped approximately 27% to $274 by late February, 2014. This may be explained by demographic changes in the composition of shoppers over the period in question, and by shoppers choosing less expensive plans as the Open Enrollment Period progressed. The average age for individual applicants went from 44 years old in mid-October 2013 to 36 as of February 24, 2014. The average premium for family plans selected by eHealth customers went from $779 in mid-October 2013 to $663 on February 25, 2014. 39% of the individual and family applications submitted in the fourth quarter of 2013 at eHealth were from individuals between the ages of 18-34. The average premium for individual policy holders in the 55 to 64 age range was $520 per month, and 21% of applicants were in this age range. Among 2014 plans selected in the fourth quarter of 2013, the highest average monthly premium for individual plans was found in the state of Alaska ($496) and the highest average monthly premium for family plans was found in New Jersey ($1,004). For more data from the Quarterly Price Index, download the full report through the eHealth Media Center. To learn more about the national Open Enrollment Period and the Affordable Care Act, visit eHealth’s ACA Resource Center at www.ehealthinsurance.com/affordable-care-act. eHealth, Inc. (NASDAQ: EHTH) is the parent company of eHealthInsurance, the nation's first and largest private health insurance exchange where individuals, families and small businesses can compare health insurance products from leading insurers side by side and purchase and enroll in coverage online. eHealthInsurance offers thousands of individual, family and small business health plans underwritten by more than 200 of the nation's leading health insurance companies. eHealthInsurance is licensed to sell health insurance in all 50 states and the District of Columbia. eHealth, Inc. also provides powerful online and pharmacy-based tools to help seniors navigate Medicare health insurance options, choose the right plan and enroll in select plans online through its wholly-owned subsidiary, PlanPrescriber.com (www.planprescriber.com) and through its Medicare website www.eHealthMedicare.com. For more health insurance news and information, visit the eHealth consumer blog: Get Smart – Get Covered.